Models showcased the first collection by “a national retailer, a leading network show, its costume designer and lead lady.” Scenes from the campaign video were projected behind the models, creating a sort of “meta” effect. The collection spans tops, pants, jackets, and outerwear, all in a muted color palette. Standout pieces included a simple white column dress and an on-trend power coat in various colors. Washington chose to dress “out-of-character,” sporting a graphic Giles dress and Roger Vivier clutch. As partygoers snapped photos of the collection, Washington’s parents stood proudly on the sidelines of the IAC building lobby. The collection starts at $49 and will be available September 23rd at The Limited Stores nationwide. 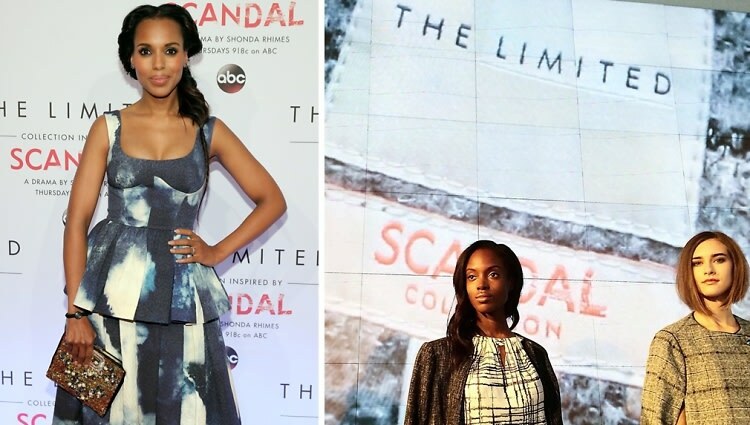 Click through our slideshow for our exclusive interview with Kerry Washington and Lyn Paolo! Who was there: Guests included Kerry Washington, Lyn Paolo, Elliot Staples, Bevy Smith, Alicia Quarles, Diane Ellis, Lauren Junge, DJ Reach, Earl Washington, and Valerie Washington.